Baharuddin Haji Ghazali is Executive Director of Gaya Tunals Sdn. Bhd, Forestry Consultants, Kuala Lumpur, Malaysia. He was co-author (with M. Simula) of the study Certification schemes for all timber and timber products (1994) on which this article is largely based. Additional input was provided by I.J. Bourke, B. Cabarle, J.-P. Kiekens, K. Kuperus, M. Simula and I. Tomaselli. An examination of the concept of timber certification, its origins and its present state of development. The future of the world's tropical forests has for some years been a major public concern in the industrialized countries. The main issues have been deforestation, biological diversity conservation and the rights of indigenous people. More recently the debate on tropical forests has accelerated in the tropical countries themselves, and the focus of international public debate has broadened to include temperate and boreal forests, notably the issues related to the clear-felling of old-growth natural forests and biological diversity conservation. 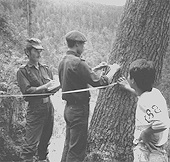 The 1992 United Nations Conference on Environment and Development (UNCED) emphasized the need for sustainable management guidelines, criteria and indicators for temperate, boreal and tropical forests alike. At UNCED, over 120 countries agreed, in the Forest Principles (which applies to all types of forests), that forest resources and forest lands should be maintained to meet the social, economic, ecological, cultural and spiritual needs of present and future generations. Owing partly to a simplistic analysis of a complex issue and partly to the wish for a quick solution, industry and trade have often been depicted as key agents, if not the key agents, of forest destruction and/or degradation. Correspondingly, a campaign, spearheaded by environmental non-governmental organizations (NGOs), was waged in the mass media citing international trade as being largely responsible for the depletion of the natural forests. Campaigns were originally oriented towards bans or boycotts of timber. More recently, the desires of environmentalists have evolved, as they came to recognize that trade in timber was not in itself harmful provided it was based on timber from sustainably managed forests. The focus shifted to the establishment of environmental labelling or certification systems that would help consumers identify and purchase wood products from sustainably managed forests. The aim was to use market-based incentives and voluntary compliance. Timber certification is a process which results in a written statement (a certificate) attesting to the origin of wood raw material and its status and/or qualifications, often following validation by an independent third party. Certification is designed to allow participants to measure their forest management practices against standards and to demonstrate compliance with those standards. Timber certification may also be used to validate any type of environmental claim made by a producer, or to provide objectively stated facts about the timber products and their forest of origin that are not normally disclosed by the producer or manufacturer. Timber certification typically includes two main components: certification of sustainability of forest management; and product certification. Certification of forest management covers forest inventory, management planning, silviculture, harvesting, road construction and other related activities, as well as the environmental, economic and social impacts of forest activities. In product certification, roundwood and processed timber products are traced through the successive phases of the supply chain. Certification of forest management thus takes place in the country of origin; product certification covers the supply chain of domestic and export markets. Consumer purchasing patterns can be influenced by differentiating similar products according to environmental and/or social attributes. Producer behaviour can be influenced by market signals based on environmental and/or social concerns. The premium generated through differentiation will provide sufficient economic incentive for producers to adopt improved management practices. Efficiency and competitiveness will increase by internalizing environmental and social concerns. Certification schemes fall under one of two basic conceptual frameworks: an evaluation of a product or a practice against particular specifications; and the evaluation of the potential of a management system to produce a desired outcome. Barron (1994) describes the practices approach as the measurement of "specific characteristics attributed to the product's origins" according to specific ecological, social and economic performance indicators. Management practices assumed to ensure sustainability are the evaluation's focus. The systems approach, on the other hand, is based on evaluation of "ability to manage in an environmentally sound and sustainable manner". Here the evaluation focuses on the operation's management structure and general condition of the forest resource. This approach is typified by efforts that are linked to the International Organization for Standardization (ISO) and its 14000 series standards relating to environmental management tools and systems to measure a company's practices (see box). In either case, a credible certification programme must evaluate the integrity of the producer's claim and the authenticity of product origin, and must be seen to be objective and impartial. Assessing integrity involves an evaluation of management practices judged against recognized standards, generally at the management unit level. Assessing the authenticity of the product's origin involves the identification and monitoring of its chain of custody, including log transport and processing, shipping, secondary manufacturing and, finally, retail distribution. the cost of the certification itself, including an assessment or audit of management practice and the cost of identifying and monitoring the chain of custody. The possible incremental costs of compliance at the management unit level are lower yields, higher opportunity costs and a different distribution of costs and benefits over time (Bach and Gram, 1993). Lower yields may be necessary to match harvest levels to the rate of annual growth, and to reduce the damage to residual timber and non-timber goods and services. Reduced timber output can be partially compensated by lower operating costs and increased recovery as a result of better planning, maintenance of a long-term supply base resulting from reduced impacts, and better protection of the increasingly economically valuable non-timber products and services. Various studies of the costs of reduced-impact harvesting techniques suggest that better planning may reduce rather than increase operating costs (Jonsson and Lingren, 1990). However, the income foregone with reduced yields can be a significant constraint. The costs of certification assessments have been estimated at between US$0.3 and $1 per hectare per year in tropical countries using local specialists. The costs of identifying and tracing the chain of custody have been estimated to be up to 1 percent of the border prices (Baharuddin and Simula, 1994). "several surveys indicate that a majority of Americans consider themselves to be environmentalists and would prefer to buy products with a lessened environmental impact when quality and cost are comparable". "there is not yet convincing evidence on an existing price premium for sustainably produced, certified timber and timber products in the market.... There are some market segments, however, where willingness to pay a premium can be observed and could be exploited by [the timber] trade." The non-market benefits produced by forests, such as regulation of climate, genetic balance, soil, water and landscape values, are well documented (although poorly quantified) in the literature. The question is whether certification will, in fact, be an effective tool to improve forest management practices and, thereby, also these non-market benefits. A major difficulty is that the costs of conserving such non-market goods and services are difficult to quantify in monetary terms and usually fall on the forest owner or manager, while the benefits largely accrue to society at large. As discussed above, the international environmental NGOs were the prime movers in the pressure for timber certification, and the most advanced efforts are still those directly led by NGOs [Ed. note: see below, Current state of certification, and also the article by Cabarle and Ramos de Freitas]. It should be mentioned, however, that NGO support for timber certification is not universal. Some organizations express doubt as to whether the social functions of the forest that brings benefits to indigenous and other communities living in or around it can be retained once logging takes place, regardless of whether it qualifies for certification. A large segment of the producer sector has been reluctant to embrace the certification movement. Opponents cite unproved market demand and question the equity of requiring an individual producer to internalize the environmental and social costs when the benefits accrue to society. Free-riders, those who make green claims without taking the same measures as their competitors, create further disadvantages and disincentives for voluntary compliance (Crossley, Primo Braga and Varangis, 1994). Others have sought to forestall the influence of independent certification programmes or have opted for their own schemes to assert green marketing claims. The views on certification in the industry vary from outright opposition to strong support. Strong support comes from importers who are directly faced with mounting pressure from local environmental groups, or traders (particularly retailers) who see certification as an opportunity to open a market niche or to obtain a distinct competitive advantage. On the other hand, there is general concern about the possible impacts of certification on production and distribution costs which could reduce the competitiveness of timber and timber products vis-à-vis substitutes in the marketplace . Very few governments have adopted official positions with regard to timber certification. Cases where a position has been taken can be divided into three groups: definitely supporting (mainly consumer countries that largely depend on importers for their timber supplies and are acting in response to market pressure); tentative or limited interest (the majority consisting of both consumers and producers); and definitely against (very few - from both consumers and producers). It is noteworthy that the views of departments or ministries within countries are often not in harmony, as departments of foreign affairs, economic and trade affairs, forestry and environment may have different perspectives on the subject. A wide range of actions are currently under way concerning the certification of forest products. Certification schemes are being developed or studied at the international, regional and national levels and exist in both developed and developing countries. However, only a small number of schemes are operational at present and the volume of timber covered by them is minor. Operational schemes include those of the Forest Conservation Program of Scientific Certification Systems and the Smart Wood Certification Program of Rainforest Alliance in the United States, and the Responsible Forestry Programme of the Soil Association and SGS Silviconsult Ltd in the United Kingdom. The following common features can be observed in the existing and planned certification schemes: a) a definition of standards and criteria, although with varying levels of clarity; b) generality, as they often refer to all types of forests and timber products; c) forest inspection and chain of custody verification; d) multidisciplinary teams consisting of local expertise for evaluation; e) standardized reporting; and f) strict rules on the use of labels. There are also important differences among the individual systems with respect to: a) the role of the companies to be certified in the process; b) the objective of the systems; c) organizational arrangements, particularly in the areas of decision-making on the rating for certification, and of accountability; d) operational procedures; and e) costs of certification. The progress in certification can be observed on three levels: development of criteria to be used in the assessment (these efforts are not directly linked to the certification process itself); development of international and national procedures and organizational arrangements for certification systems; and work carried out to develop individual certifiers' systems. A fourth area could be developments in the market pressures towards certification. In many European countries there is an ongoing process to develop national-level criteria for sustainable forestry within the so-called Helsinki process. The work has been expanded to boreal and temperate forests outside Europe under the so-called Montreal process. The International Tropical Timber Organization (ITTO) has developed guidelines, criteria and indicators of sustainable forest management for tropical countries which are being further elaborated in some producing member countries. These international and national criteria and indicators are not being developed specifically for certification purposes but they can serve as a useful framework in this regard. It is noteworthy that the various processes are not necessarily developing criteria and indicators at the same level; some are working at the national or regional level, while others are concentrating on the management unit level. In a number of countries, the forest industry and private forest owners, through their associations, have also come forward with guidelines for good forest management which may be expressed in qualitative and quantitative terms. In most cases, these are not specifically designed for certification scheme use. In Brazil, however, certification criteria for plantation forests have been defined within the national Cerflor certification system which is being launched under the leadership of the Brazilian Silvicultural Society (SBS). In Sweden, national-level criteria were recently proposed by the World Wide Fund for Nature-Sweden together with the Swedish Association of Nature Conservation (SNF). As far as the development of national systems is concerned, Indonesia is probably one of the most advanced countries. A decision has been taken to establish a national timber ecolabelling institute and substantial work has been carried out to develop the criteria for assessment and tracking procedures. In the United Kingdom, the Woodmark system has recently been introduced by the private sector; however, this is more a certificate of origin than a certificate of the state of forest management. Such schemes have also been discussed in other countries (e.g. Switzerland). In Canada, an industry-supported team involving the provincial governments is moving strongly on developing a certification system, intended to serve as a model on which a proposed ISO system could be built. In Germany, the main system is the private sector Initiative Tropenwald which, at present, is limited to tropical timber; in future it will be expanded to cover all timber. In the Netherlands, a process is under way to establish certification of imported timber, especially tropical timber; it will also include domestic timber in the future. In the Nordic countries, discussions are under way at various levels both within and among countries. In Norway, the private forestry sector, government and NGOs are discussing a form of certification. Sweden is developing a system which may be linked to the Forest Stewardship Council (FSC), but discussion is still ongoing. The private sector in Sweden sees certification as a market tool and not a matter for government regulation. In Switzerland, a system is being developed involving the private forestry sector, environmentalists and other interested groups. The issue is also under review by the European Union which has in the past focused mostly on support to member countries of the African Timber Organization (ATO). As for market pressures, the most visible phenomenon has been the WWF Target 1995 Group in the United Kingdom which was set up to phase out trade in uncertified timber by associates of the group by 1995. This target date has proved to be impractical and now the objective has been redefined to increase the share of certified timber continuously in total purchases. There were approximately 50 associates in the WWF Target 1995 scheme in May 1995, including do-it-yourself supply stores, importers and merchants. The problems and constraints related to timber certification lie mainly in the lack of generally accepted international principles and criteria to assess forest management sustainability; the lack of a widely accepted accreditation process for certifiers; and the emergence of many parallel systems. As has been discussed above, much effort at both the national and the international levels is currently being invested to determine the principles, criteria and indicators of sustainable forest management. However, this work continues to be fragmented, overlapping and even conflicting at times. Certification suffers from an important weakness: it is not always clear who is providing the information or what standards are being used to assess the claim. For example, a 1991 WWF study of "sustainability" claims applied to wood products by over 600 companies operating in the United Kingdom revealed that only three were able and willing to substantiate their environmental marketing claims (Read, 1991). As early as 1990, calls echoed from various interest groups for the establishment of an accreditor for certifying organizations to ensure the creditability of market claims. The Forest Stewardship Council is the leader in work towards the evaluation of certifiers for the purposes of accreditation [Ed. note: see article by Cabarle and Ramos de Freitas]. Currently, the certification picture is clouded by the development of many competing and even conflicting systems. There is a real risk that timber suppliers may be called on to acquire more than one certificate for the same product in order to satisfy different groups of customers, each with its own allegiance to a given certification scheme. Beyond these practical challenges, there is a larger philosophical question concerning the potential for certification schemes actually to do what they set out to do, i.e. provide a positive impact on the management of forest resources. There often seems to be a general feeling that certification is "inevitable" but that there is scant evidence of the real potential of this type of approach in contributing to sustainable forest management [Ed. note: see article by Kiekens]. The awareness of the need for sustainable forest management is worldwide but agreement on the potential role of timber certification in achieving this goal is by no means equally widespread. Any viable timber certification scheme will need to be seen to be credible, objective with measurable criteria, reliable and independent and, most important, covering all types of timber. Participation must be voluntary, non-discriminatory in nature and adaptable to local conditions, cost effective, practical and transparent. So far, timber certification has not been applied on a wide enough basis to prove its practicality in application, its effect on the market or its contribution to good stewardship of the forest. The issue remains highly political in nature and will no doubt continue to be a subject of active international and intergovernmental debate for some time before a solution is found. Abusow, K. 1995. ISO 14000: what is it? What does it mean to the forest products industry? Canadian Papermaker, 48(1). Bach, C.F. & Gram, S. 1993. The tropical timber triangle - a production-related agreement on tropical timber. Copenhagen, Department of Economics and Natural Resources, Royal Veterinary and Agricultural University. Baharuddin, Hj.G. & Simula, M. 1994. Certification schemes for all timber and timber products. Yokohama, Japan, ITTO. Barron, D.E. 1994. Sustainable forestry certification. Paper presented at the 75th Anniversary Annual Meeting of the Woodlands Section, Canadian Pulp and Paper Association, Edmonton, Alberta, Canada. Cabarle, B., Elliot, C.,Hrubes, R.J. & Synott, T. 1995. Certification accreditation: the need for credible claims. J. Forestry, 93: 4. Crossley, R., Primo Braga, C.A. & Varangis, P. 1994. Is there a case for tropical timber certification? Working Paper, Washington, DC, World Bank. EPA. 1993. Status report on the use of environmental labels worldwide. Washington, DC, Office of Pollution Prevention and Toxics, Environmental Protection Agency. Jonsson, T. & Lingren, P. 1990. Logging technologies for tropical forests - for or against? Kista, Sweden, Forest Operations Institute. Read, M. 1991. An assessment of claims of "sustainability" applied to tropical wood products and timber retailed in the United Kingdom, July 1990-January 1991. London, World Wide Fund for Nature. Winterhalter, D. & Cassens, D. 1994. Consumer perceptions of forest sustainability and willingness to pay: results of a national survey. Lafayette, Ind., USA, Purdue University Press. WWF. 1994. Truth or trickery? : timber labelling past and future. London.